Southeast Alaska is big, just like all of Alaska. You get used to the large scale/small area high quality nautical charts that Canada issues, so when you reach Alaska it’s a real eye opener to realize how much bigger everything is. Channels are wider, anchorages that look small on the chart actually have room for dozens of boats. There is something about the terrain in Alaska that makes it very hard to judge distances. 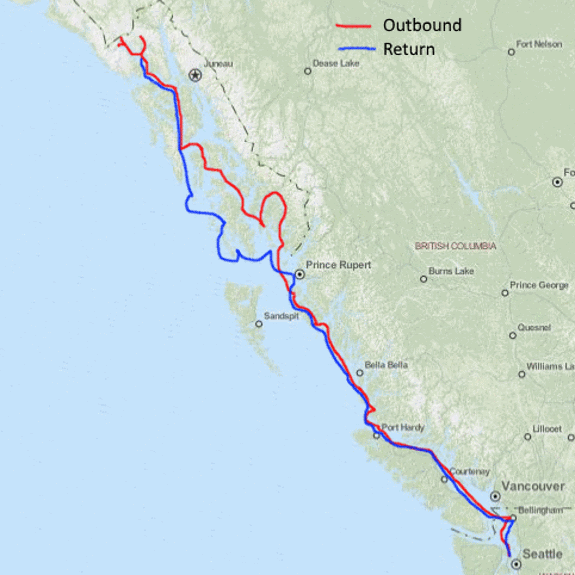 The other thing about Southeast Alaska in comparison to the North BC coast is that there are a lot more people – a lot more towns, a lot more fishermen, a lot more recreational boaters. And yet it’s so big, there is plenty of room for everyone. 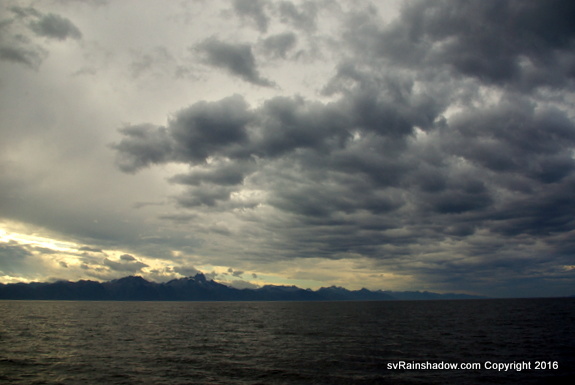 The most exciting part of the voyage for us was our visit to Glacier Bay National Park. We were able to get two consecutive 1 week permits, so we were in the park for 14 days, yet we still did not have enough time to explore all it’s bays and inlets. Glacier Bay may be the most beautiful alpine scenery I’ve ever seen, and I’ve done a lot of backpacking all over the world. The magic of Glacier Bay is the geology. Where the glaciers retreated a couple hundred years ago, the trees grow from the waterline up the surrounding mountains. But as you progress up the channels closer to today’s location of the tidal glaciers, the metamorphic rocks are scraped clean of any vegetation and you can see the fascinating and beautiful rock formations that are covered with cascading waterfalls dropping from the hanging glaciers. It’s stunning. 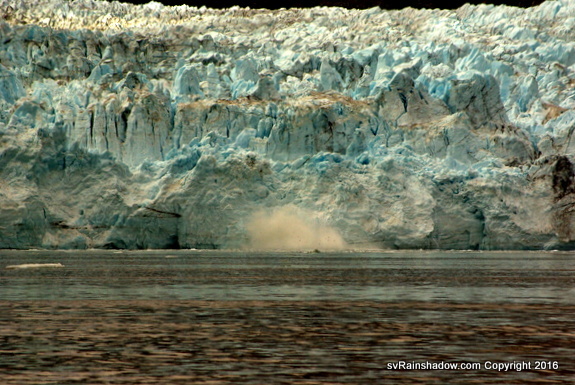 The pictures below don’t do it justice – only a visit in a private boat will do so you can get into inlets that commercial boats are not allowed to go, such as Muir Glacier and Johns Hopkins Glacier. While the commercial tour boats sit in front of Margerie Glacier for 30-45 minutes, we watched the groaning, cracking, calving glacier for 8 hours and still found it hard to leave. 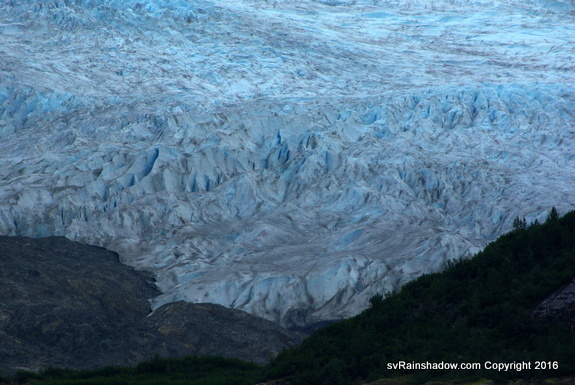 A couple days later, we spent 4 hours in front of the more active Johns Hopkins Glacier and could easily spent another 4 hours if it wasn’t so far to travel back to the closest area that was a passable anchorage. 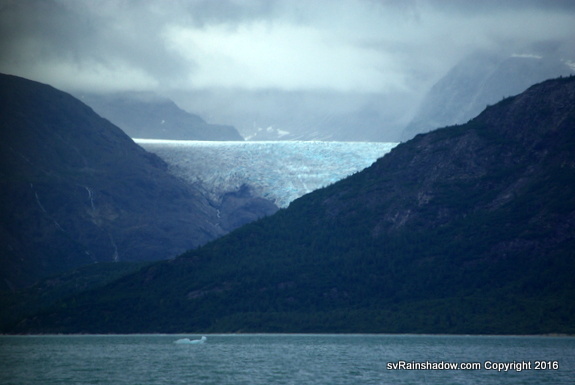 I could go on and on about Glacier Bay – it was definitely the highlight of the trip. 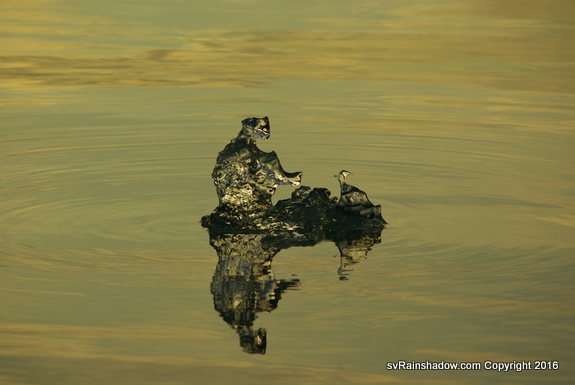 One would think we would want to go back year after year, but the other part of Glacier Bay is that all that floating ice makes the water very very cold. It’s 35 degrees F in front of the glaciers, which means being in the cabin is like living in a refrigerator. After two weeks of condensation dripping down our insulated hull and soaking our interior cabinetry, we were ready to leave and not come back until we’ve cruised warmer waters. When we finally reached our homeport after 4 months of many long days underway, we had gone 2700 nautical miles – and with only a few dings on the hull to show for it: one when I hit a rather large ice chunk while gawking at Margerie Glacier, and another when I collided and then bounced off an uncharted rock outside Welcome Harbour on the B.C. Coast. The latter was the more alarming, but Rainshadow is a tough old boat and handled it better than her crew. I put a few photos below, but there are many more on my Flickr account here. 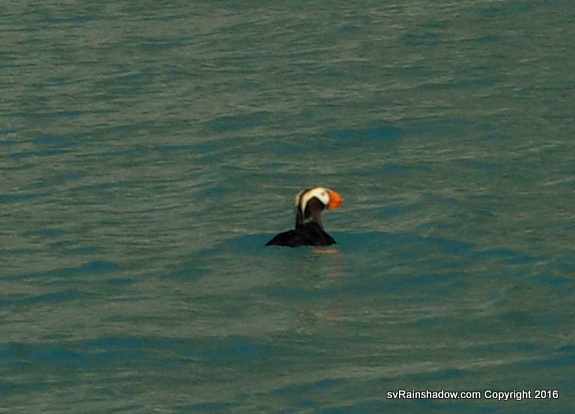 We only saw Puffins in Alaska, with most of them being in Glacier Bay. Everything is just bigger in Southeast Alaska. certainly enjoyed all the bloggs we have read. Hi Marilyn & Van. Good to see a Nic-38 being used to do exactly what she’s built for. Exploring….Brilliant.! Brrr.! Prefer to be in the Tropics myself though. !